The winger pulled the Seasiders level on 65 minutes with a deflected strike after Lee Peltier had headed Leeds - who stretched their unbeaten run to five and remain in the Sky Bet Championship play-off places - in front. Kirk Broadfoot was sent off for a nasty challenge on Marius Zaliukas in the dying minutes, the ninth red card for Blackpool this season, but Paul Ince's side held on for a point. It was Blackpool who started the better as they looked to end a run of two home defeats from their last three Championship fixtures. The Seasiders enjoyed the greater possession inside the opening 30 minutes, but their inability to create a meaningful opportunity proved their downfall as the visitors broke the deadlock with their first sight of goal. With 25 minutes gone, a deep cross from the left wing by Danny Pugh found Peltier at the back post and the defender sent his header back across goal and into the left hand corner. But just 10 minutes later the home side created a wonderful opportunity to level. Broadfoot met Tom Ince's inswinging corner-kick, but the centre-back could only power his header over the crossbar. Paul Ince's side continued to look for an opening but appeared bereft of ideas from open play, with Michael Chopra - making his first Championship start since August - cutting an increasingly isolated figure in attack, as Leeds held firm and headed into half-time good value for their 1-0 lead. Minutes into the second half, Blackpool were fired an early warning as Jason Pearce escaped his marker at a corner-kick and turned a Michael Tonge delivery just past the post. The Seasiders responded with two efforts of their own as Broadfoot smashed high and wide from the right side of the box and Jack Robinson narrowly cleared the crossbar with a rising 30-yard shot. The home side continued to struggle in the final third but they managed to haul themselves back into the game - albeit courtesy of a touch of fortune - on 65 minutes. Barry Ferguson's free-kick from the right was only half cleared and the ball fell to Tom Ince on the edge of the box, whose left-footed half volley took a deflection on its way past Paddy Kenny. The elation of the home support could easily have been short-lived though, with Broadfoot fortunate to be shown just a yellow card when he brought down Ross McCormack as he ran through on goal, 18 yards out. 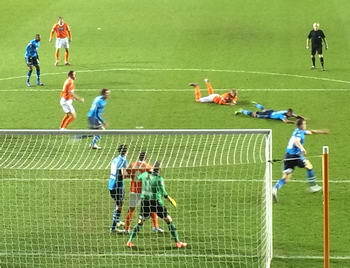 The game was developing into an end-to-end contest and it was Blackpool's turn to threaten with 14 minutes remaining. Neal Bishop's through ball found Tom Ince inside the area and after shifting the ball on to his left foot, the 21-year-old curled a low effort inches past the bottom left-hand corner. Broadfoot was then given a straight red card for a high tackle on Zaliukas as the match entered injury- time, but the Seasiders held on for a much-needed point.